Diana is one of the most successful amateur triathletes in the world. She is the 2017 Hawaii Ironman Champion W50-54. She joined us as an athlete back in 2008 when she met some of our elite team members at races and noticed how well they were improving. Over the years she has become an advocate for training smart and she really enjoys helping triathletes who seek her advice. It was only normal for her to join our coaching staff in 2015. Diana discovered her passion for triathlon later in life, having competed in her first triathlon at age 29. As a child she ran cross country and track and has been an avid master's swimmer and competitor since 1986. Diana is also a cat 2 cyclist and has held age group titles in the Colorado State Time Trial Championships, Road Race Championships and Best All Around Rider. She began competitive cycling during her PhD training at UC Davis that readily translated into successful triathlon performances. She has extensive experience with both heart rate and power training for the bike. 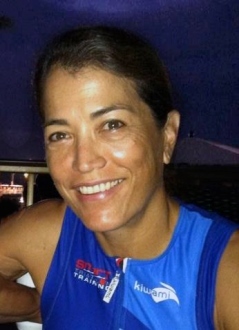 Her knowledge of training methods and her vast experience in racing combined with her unparalleled results will be a great asset to SmartTriathlonTraining. Diana is one of the most decorated athletes with 10 Hawaii Ironman age group podium awards including one World Championship. Diana will be helping all of our athletes on our internal “ask the coach” page. Her career as a surgeon and criticalist in veterinary medicine with a PhD in Comparative Pathology and lifelong fascination with exercise physiology and nutrition adds to her coaching expertise. Diana lives in Ft Collins Colorado with her husband, Dean, who is also a triathlete, and her daughter Mikayla, an avid horseperson.